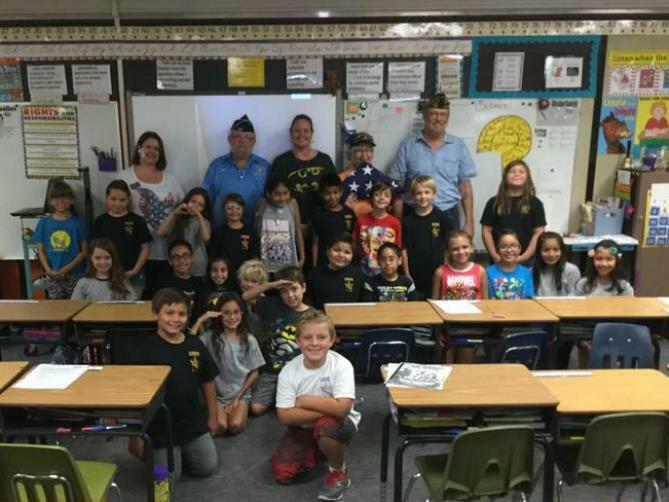 On September 15, 2016 2 comrades and 3 auxiliary members visited Havasupai Elementary School to visit with Ms. Tiffany Berry’s 3rd grade class for US Constitution Day. During our visit we had the privilege of talking about the importance of the US Constitution, what it stands for, who the framers of the Constitution were, what the need for having such a document means to the United States. Along with our presentation we handed out coloring pages for Ms. Berry to use in her curriculum as they discussed this topic in the coming days. We then were blessed with the class teaching us how well they knew the Pledge of Allegiance and the meaning behind the words they had just recited. We shared with the class what the colors of the American Flag mean, proper flag etiquette, and then with the help of three students our VFW members taught the class how to fold the American Flag. This was a great opportunity for the Comrades and Auxiliary members of VFW Post 9401 to interact with the children of our community, share our knowledge on principles the United States were founded upon, and for us to learn just how excited the kids in the classroom are about learning history and getting to speak with veterans from their local community.